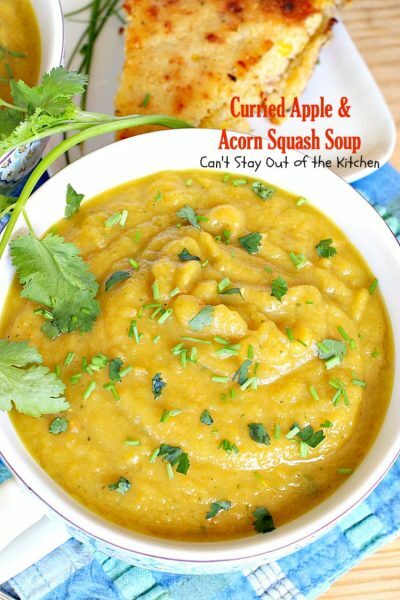 Curried Apple and Acorn Squash Soup is sensational. This lovely vegan and gluten free soup recipe is highly seasoned with curry powder, cilantro, and cayenne pepper. If you like mildly hot, spicy soups, then the tantalizing aromas and taste of this spicy food will send you over the edge. It’s fantastic! If you enjoy super spicy hot soups, use red curry powder instead of regular. It has twice the heat. 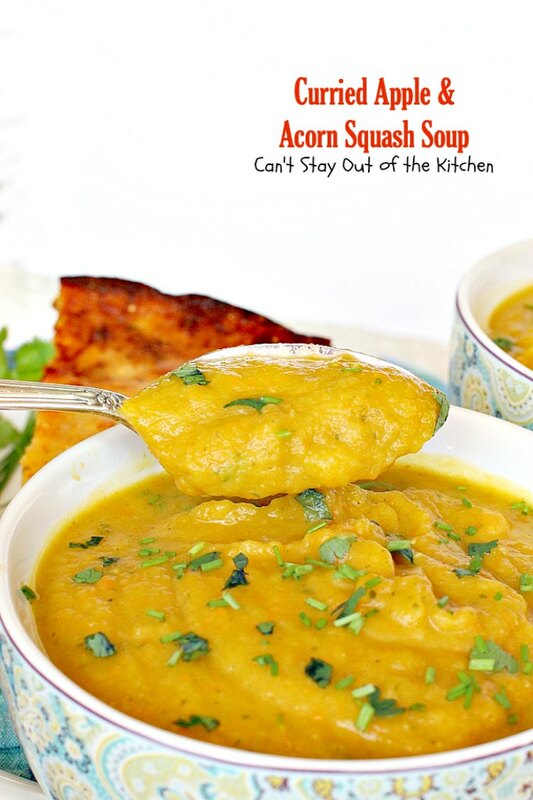 I was looking for a savory curry-flavored soup last week as a way to use up acorn squash. I had in mind some of the things I wanted to put in the recipe and some of the spices I wanted to use but I could never find any one recipe that had it all. Instead, I made up my own using the ingredients I wanted to use. Curried Apple and Acorn Squash soup is rather easy to prepare. 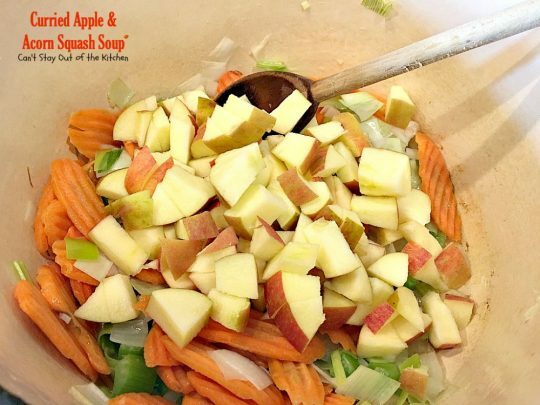 The soup is filled with carrots, celery, leeks, onions, garlic, apples and acorn squash. I used coconut oil and Almond Breeze in the recipe to keep the soup completely vegan. I topped the soup with snipped chives and chopped cilantro which increased the tasty flavors of this soup. 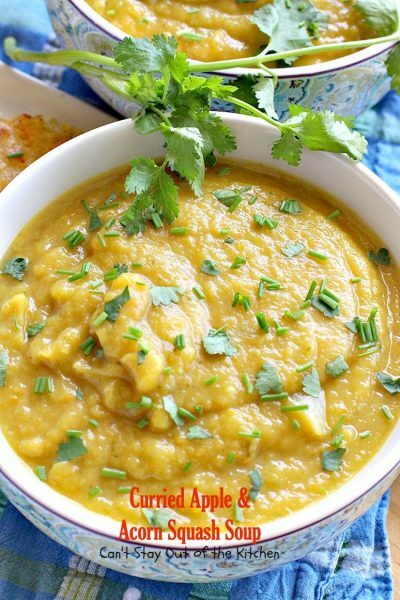 So if you like gentle heat in your soups consider giving this one a try using regular curry powder. If you desire a lot more heat, use red curry powder. 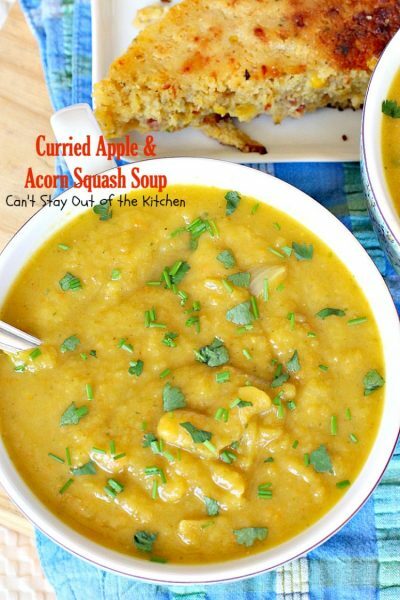 Either way, Curried Apple and Acorn Squash Soup is a nice hot, spicy soup for cold winter nights. Serve with gluten free cornbread or crackers if desired. When I initially published this recipe in January 2013, it was before I began using my Canon camera to take pictures. Unfortunately, the pictures were taken with an iPhone with poor lighting so they were not as crisp and clear as I would have liked. I recently remade this recipe (July 2016) to serve for lunch with a friend. I served it with Simply Delicious Homemade Hummus with lots of veggie dippers. I also had a bowl by myself with a scrumptious “Cracked Out” Sweet Cornbread. Ah, yes. It was the perfect lunch even in the middle of a hot Texas summer. Curried Apple and Acorn Squash Soup is a mildly hot and spicy soup that’s good for what ails ya! Don’t forget to share some with your family members! This soup has a mild amount of heat. But if you like really spicy and hot soups you can use red curry powder increase the cayenne pepper, if desired. Extra cilantro and snipped chives for a garnish increase the wonderful flavors of Curried Apple and Acorn Squash Soup. Bake acorn squashes about an hour at 350. Cut in half. Remove pulp and seeds and discard. Remove squash from shell and set aside. Place a couple of tablespoons of coconut oil in a large stock pot. Melt coconut oil over a medium heat. Slice up a leek. Cut off the bottom and all of the dark green leafy top portion. Wash leek thoroughly to get out any sand between layers. Slice leek and put in stock pot to saute. Chop up one large onion and add to stock pot. 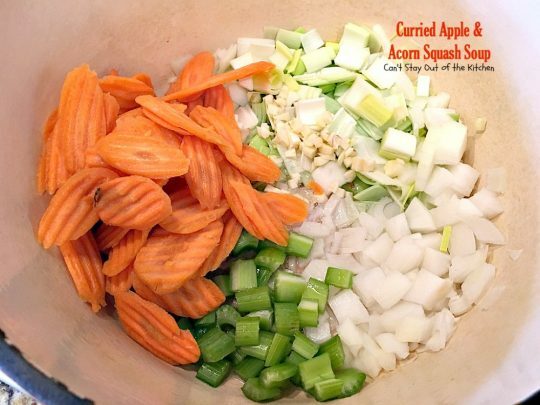 Add carrot chips or sliced carrots, celery and garlic. Add diced apples. Saute 5-10 minutes. Add a quart of vegetable broth, curry powder, cayenne pepper and salt and pepper. Stir all ingredients together. I simmered the mixture over medium heat for about 30 minutes. Mash baked squash and add to stockpot with cilantro and Almond Breeze. Simmer an additional 15 minutes. Use an immersion blender to puree all the ingredients together. Garnish the soup with chopped cilantro and snipped chives. This soup is mildly spicy from the curry powder and cayenne pepper. If you like hotter spicier soups, use red curry powder and additional cayenne pepper. 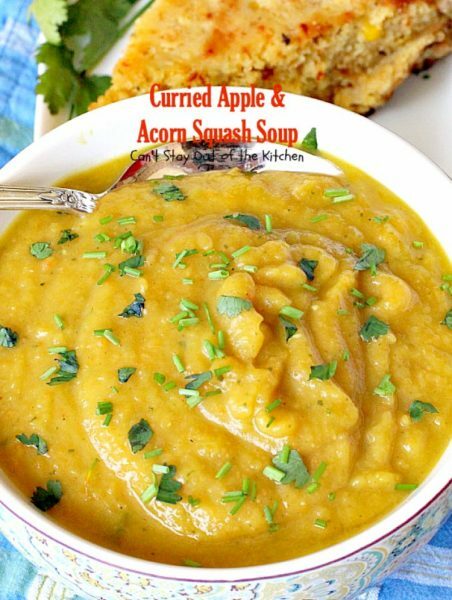 This delicious Curried Apple and Acorn Squash Soup is a great, healthy, low calorie, vegan, and gluten free option. 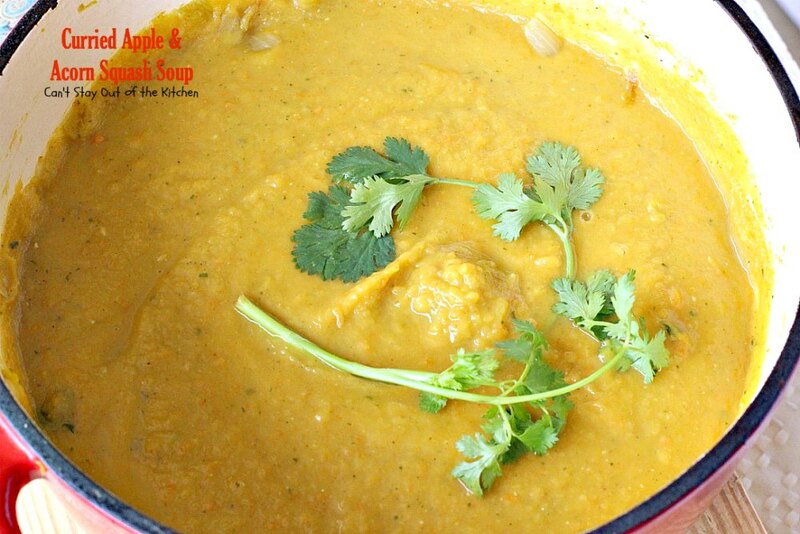 Savory and delicious Indian soup recipe with apples, acorn squash, carrots and other veggies. 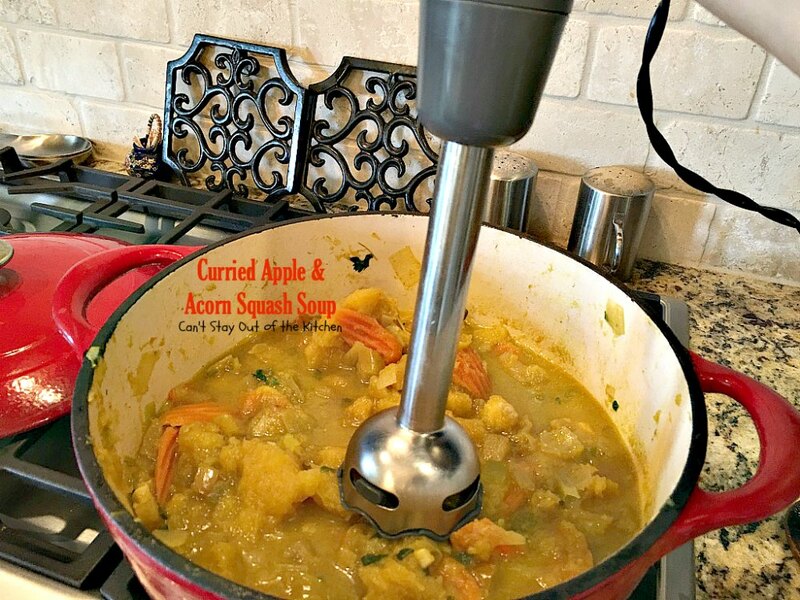 This spicy recipe includes cayenne pepper, curry powder and cilantro and is vegan and gluten free. 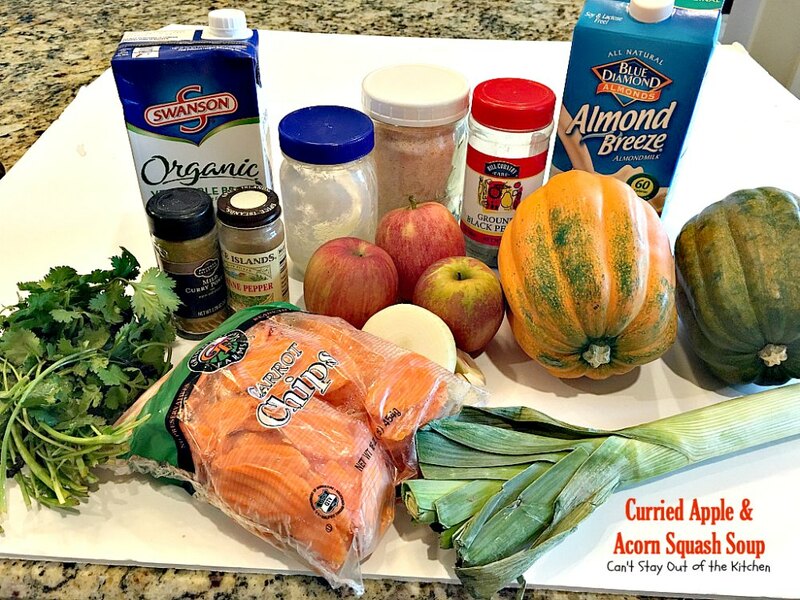 Roast acorn squash in oven until baked at 350 – approximately 45 minutes to 1 hour. Cut in half, remove seeds and pulp. Remove squash from shell and set aside. In large stock pot place coconut oil. Add sliced leeks, celery, garlic, chopped onions, carrot chips and apples. Add curry powder, salt, pepper, cayenne pepper and vegetable juice. Simmer about 30 minutes until vegetables are soft. Stir in squash, cilantro and [url href="http://www.almondbreeze.com/" target="_blank"]Almond Breeze[/url]. Simmer another 10 or 15 minutes. 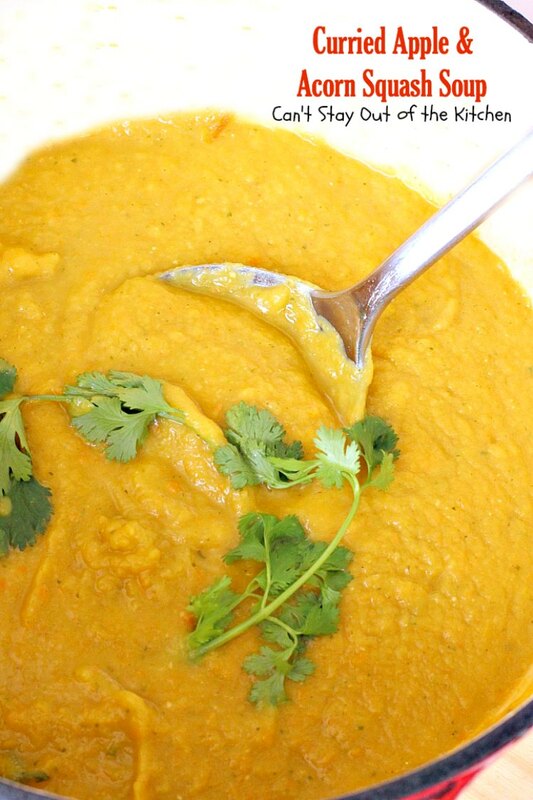 Use blender or emulsion blender to puree soup until well blended. Garnish with additional cilantro and snipped chives. NOTE: The baking time for the acorn squash is not included in the preparation time. NOTE: Red curry powder is significantly higher in heat. Use it only if you’re used to a lot of heat. Stir in squash, cilantro and [url href=”http://www.almondbreeze.com/” target=”_blank”]Almond Breeze[/url]. The baking time for the acorn squash is not included in the preparation time. [br][br]Red curry powder is significantly higher in heat. Use it only if you’re used to a lot of heat. 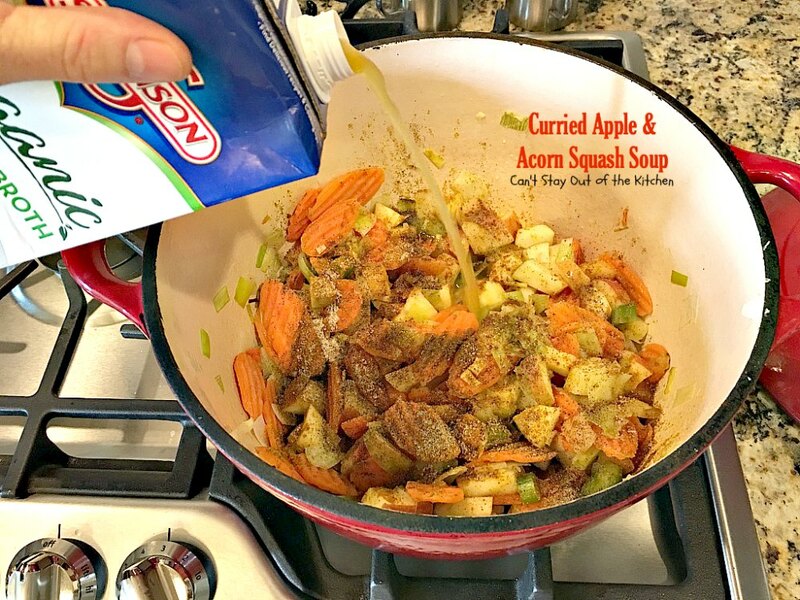 This is a great vegan soup recipe. 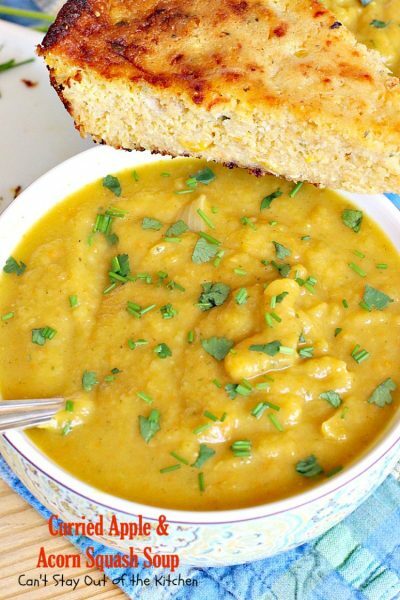 If you enjoy spicy soups you’ll love this delicious soup. It’s very warm and comforting on cold winter nights! 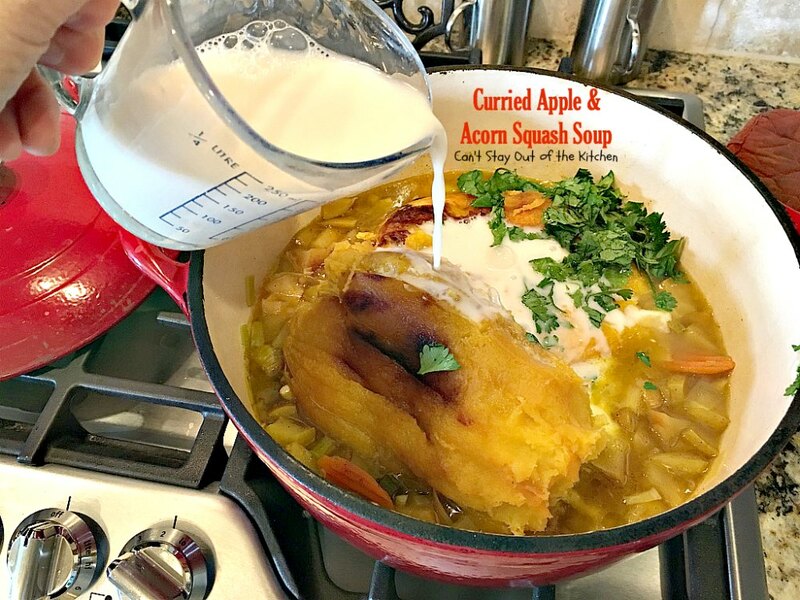 We really enjoyed Curried Apple and Acorn Squash Soup. Serve it with fresh baked “Cracked Out” Sweet Cornbread or rolls. Yum. Be brave. Sprinkle a little more cayenne pepper or hot red curry powder over top for a garnish, if you dare! Teresa, looks hearty, warm, and delicious !! I love hot curry soups, but I admit they are not for everyone.